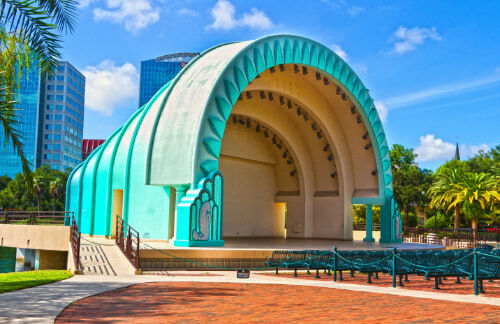 From lakeside concerts to private events to gorgeous greenery, there are many reasons to visit Lake Eola Park. No matter what draws you to this Orlando urban oasis, make sure your transportation plans are simplified with a charter bus or minibus rental. National Charter Bus offers a variety of services for groups and events of all sizes, all at a predictable price point. 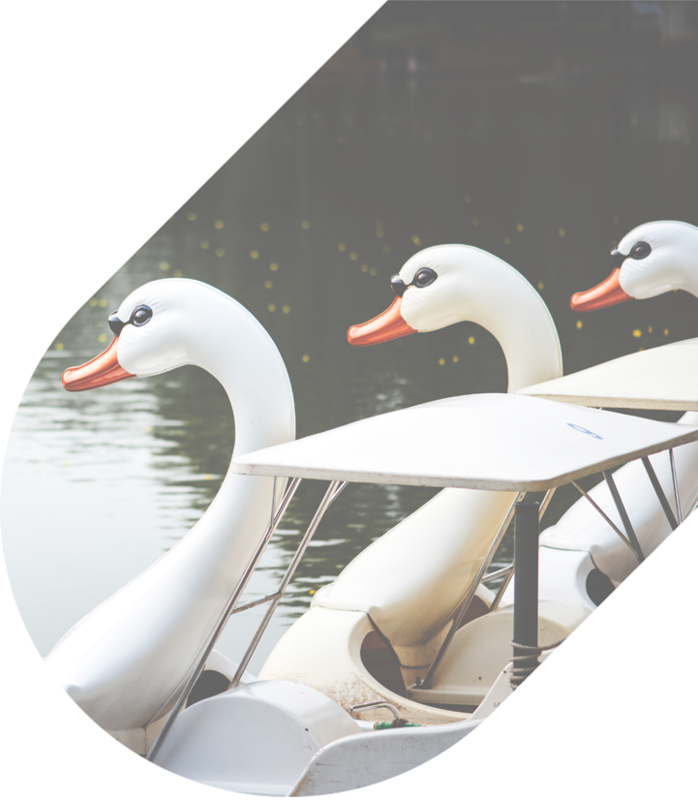 Our dedicated team is available 24/7 to assemble the perfect fleet for your group outing to Lake Eola Park. Call 407-274-9782 today to get started! Nestled in the heart of Downtown Orlando, Lake Eola Park draws tourists and locals alike to its green lawns and waterfront walkways to enjoy nature and stretch their legs. The park originally was purchased by cattle rancher Jacob Summerlin in 1873. Not long after he bought the land, a sinkhole formed and filled with water due to a natural aquifer, creating Lake Eola. Today, the 24-foot deep lake is a major attraction of the Orlando cityscape, with a light-up fountain, a walking trail around its circumference, and a variety of resident waterfowl. Visitors often delight in feeding the several swan species, taking swan-shaped paddle boats for a spin on the lake, or simply relaxing among the beautiful flower beds. Lake Eola Park’s convenient location near Orlando’s city center makes it an easily accessible destination from nearly anywhere in town. Out-of-town visitors, however, may find navigating to and parking around the park to be a challenge, especially during events and festivals. Street parking along Central Boulevard and Rosalind Avenue is metered and fills up quickly, and the closest parking garages are anywhere between two and five blocks away. The hassle of locating and paying for enough parking spaces to accommodate large groups can hamper any park experience, so we advise taking these factors into account before your visit. To bypass these hurdles, we recommend booking a 20-passenger minibus rental if you’re venturing to the park from within city limits. With their compact size yet roomy interior, the minibuses we charter are perfect for navigating busy Orlando traffic and parking in the city. Your professional driver can handle the parking arrangements, so you can save time and money while you explore the park. Every March, professional and amateur cyclists are invited to participate in this city-wide bicycle race which loops past the streets near the park. Spectators often flock here to get unobstructed views of the cyclists rushing by, so get there early to secure your spot. Swing by on July 4th for this park-wide, patriotic celebration! Set up a picnic, watch live bands perform, and check out the local food vendors. Festivities start at 4pm, and the fireworks show begins after sundown. Wander the nearly 600 booths and tents at this arts and crafts show during the first full weekend in November. This festival lets visitors connect with local artists and enjoy local music, food, and drink. Celebrate National Coming Out Day at this pride festival hosted at the park. Members of the LGBTQIA community and allies alike are invited to take in the parade, vendors, food, and fireworks. Every Sunday from 10am to 4pm, local farmers, vendors, and artisans gather at the park to sell their wares. Come support local businesses and pick up fresh, local produce and goods. Whether your biking team needs a ride with enough room to store their equipment or your community needs a long-term shuttle service to and from the farmer’s market, we’ve got you covered. National Charter Bus specializes in pairing each group of travelers with the perfect ride plan to suit their needs, from the bus size and model down to the individual amenities that make each passenger’s experience that much more personalized. Even better, we only work with experienced, certified drivers that have passed a series of background checks, drug screenings, and performance exams. Simply plot out your preferred pickup and dropoff locations, let a trained professional take the wheel, and rest assured that your group will arrive at your favorite park events on-time and safe. Beside large-scale, public events, Lake Eola Park is also a favorite location for private get-togethers. From heartwarming wedding ceremonies at the park’s Chinese pagoda to company holiday parties at the Eola House, this Orlando greenspace is perfect for events of all kinds. Request a reservation for your personal, parkside event here. No matter the occasion, you’ll want to make sure your guests are well-cared for and relaxed. One way to ensure their comfort is to plan the transportation logistics before everyone gets together. Arranging carpools and rideshares can be tedious and time-consuming, and finding enough vehicles to accommodate all your guests can be nearly impossible. Combined with the hassles of handling navigation, parking, and pick-up times, these transportation woes can hinder an otherwise flawless event for your attendees. Why not forgo these issues by investing in a bus rental for your private engagement? With one call to National Charter Bus, we can assist you in all the transportation details for your next event. We know that no two events are the same, so no one should settle for a cookie-cutter rental plan. Buses in our network vary in size, from a compact 18-passenger minibus to a full-sized 56-passenger charter bus. Mix and match the vehicles in your custom fleet to best cater to your unique get-together. Whether your employees need a quick shuttle from a nearby workplace or a ride to Orlando from cities like Tampa or Miami, we’ll pick you up curbside and get your group going! Your attendees will arrive refreshed and ready to go with amenities like on-board WiFi, power outlets, reclining seats, or any of the upgrades available for buses in our network. 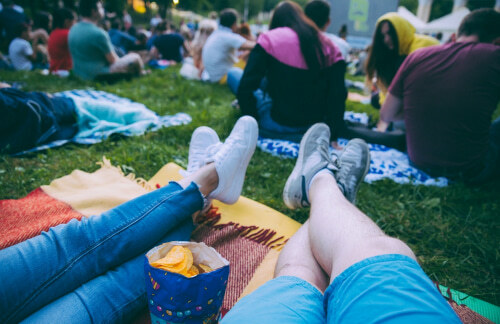 Many amenities are available at no additional cost, so feel free to ask your representative about all the bells and whistles that will make your private event at the park that much more enjoyable. Ready to reserve your ride? No matter where your travels take you, prepare for your ultimate park outing by arranging the transportation through National Charter Bus. A representative is waiting to assist you in all your travel-related endeavors and offer a free, personalized quote. Call 407-274-9782 today and streamline your trip to Lake Eola Park, around Orlando, and nationwide!